The years are adding up as fast as all those NCAA basketball titles he won. John Wooden will turn 97 Sunday, and those who think that makes him blessed have it wrong. The rest of us are blessed. We used to ponder the unthinkable. Now we assume immortality and refuse to think otherwise. It will be a weekend of celebration. The former UCLA basketball coach turned philosopher and humanist will go along to the parties and be the most bemused person there. He has never quite figured out that the rest of us have figured him out, that we now understand how basketball was merely a front for a career of teaching life and perspective. Friday night, close friends and many former UCLA players gathered at the home of former player Andy Hill, a member of three of Wooden's 10 NCAA title teams. Sunday will be time for immediate family, a group that has mushroomed with grandchildren and great grandchildren for party of about 40. Today, we will let a selection of his former students do the public celebration. Their names are familiar because their classroom was Pauley Pavilion. They could be considered Wooden's all-time All-American team, but you'd have to go about 30 deep to truly do that justice. So Kareem Abdul-Jabbar, Mike Warren, Henry Bibby, Gail Goodrich and Bill Walton -- imagine what a three-guard, double-post offense that would have been -- have the podium. Abdul-Jabbar is 60, an assistant coach with the Lakers. He was the star on three of Wooden's NCAA title teams and is the leading scorer in NBA history. He has written six books and is currently working on a documentary about the Harlem Rens professional basketball team of the 1930s. "I would not have had any success as a parent if I had not had John Wooden as a coach," he says. "He gave me ideas of what the boundaries are. My children are all college graduates, none have substance-abuse problems and none have children out of wedlock." 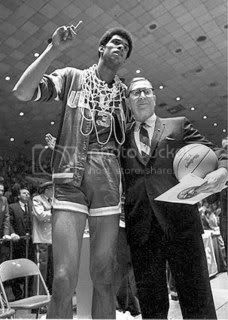 Abdul-Jabbar, then known as Lew Alcindor and referred to by Wooden as "Lewis," remembers learning to never doubt his coach's wisdom. "My sophomore year, we were playing Colorado State," he says. "It's at Pauley, but it is close. At a timeout, late in the second half, his instructions were surprising, contrary to logic, contrary to something I thought we should be doing. They had the ball and I was looking for defensive instructions, how to stop them this time down. Instead, he told us to foul one of their guards as soon as he got across half court. They were in the one-and-one, so that really didn't make sense to me. "But we did as we were told, and the guy missed the front end of the one-and-one. We got the rebound, went down and scored and the game was over. "Never again did I question him." Warren is 61, and was recruited from South Bend Central High in Indiana, where Wooden had once taught and coached. He was on two NCAA title teams and has had a successful acting career. Currently, he works on ABC's "Lincoln Heights" and is doing on a documentary he calls a love story. It is about John and the late Nell Wooden. "One of the reasons I left the Midwest was to get away from my parents," he says. "They were great parents. No one in my life has been more important than my parents. But it was time for me to be on my own. So I go 2,000 miles and there he is, John Wooden, just like them. "I arrive and I am 18 years old, a grown man now, of course. And there are parties and something going on day and night in the UCLA campus. I'm there, enjoying it all. "Then I get a call to see Coach Wooden. I'm fine. Excited. Figure we would talk about basketball. Then I get to his office and he's looking at me. Those beady eyes. He asks me if I know why I am here and I tell him yes, to play basketball. And he says, no, I'm here to get an education and if I don't shape up, I'm going to get neither basketball nor an education. He says my parents would certainly not appreciate the way I am conducting myself. "The next quarter, I was on the Dean's List." Bibby is 57, in his third season as an assistant coach with the Philadelphia 76ers. He is a former coach of USC and the Sparks of the WNBA. With Bibby as starting guard, UCLA won three titles. Bibby played high school basketball in Franklinton, N.C., population 1,300. There were 19 students in his graduating class. Wooden heard about him during a basketball camp appearance in Bowie, N.C., and visited him and his parents. "It was 1968, it was the South," Bibby says, "and yet they looked at him as nothing more than a man, right from the start. There were no race issues at all. With them, it was never about UCLA. It was about John Wooden." Bibby says he went to Wooden's house four or five years ago, to talk about jobs, ask for advice, just catch up on things. "That day changed my life," he says. "It was like going home to your parents. I saw how it was never about one player, but about all his players. He didn't care about the game or the winning, just the people." Goodrich is 64, lives in Greenwich, Conn., and works as an analyst for NBA TV and for ESPN International. Goodrich starred in the first two of Wooden's NCAA titles, in 1964 and '65. "I remember in the locker room before that first title game in '64," he says. "We were 29-0, playing Duke, and Coach Wooden started to talk. No fire and brimstone. He just told us that we got there playing a certain way -- full-court press, taking full advantage of our quickness -- and regardless of the outcome, we should play the way we knew. "Then, he did something I'll never forget. He asked us all if we remembered who finished second last year. Nobody said a word. I actually did remember. Loyola of Chicago had beaten Cincinnati. But I didn't say anything. "He waited, then said that nobody will remember who finishes second tonight." Goodrich says he once tried a behind-the-back pass and the ball went into the stands. "In the locker room, he went off on me, but as only he can do," Goodrich says. "He never cursed, but when he started out with his 'Goodness gracious sakes alive,' I knew I was in big trouble." Walton is 54, almost as big a star in the world of sports broadcasting as he was at UCLA and in the NBA. He starred on two NCAA title teams. He talks to Wooden frequently, in person and by phone, and jokes that, as a person who once had a speech impediment that made him verbally withdrawn, he may have overdone his turnaround. "The famous broadcaster, the late Marty Glickman, taught me how to get past my speech problems in order to be a broadcaster," Walton says. "Now, Coach Wooden is always saying to me how sad it is that Marty is not with us anymore so he could get me to shut up." Walton might be the most loyal of all Wooden loyalists. And he always takes note when he sees where that loyalty originated. "Wooden doesn't even hesitate. He says to Wilt, 'Which one of you won three NCAA titles?' Then he looks at Kareem." Because he always has so many, Walton will get the last word. His teammates here would understand. "People who don't know John Wooden come up to me and say, 'Ah, come on, you talk like he's perfect.' I tell them that he isn't perfect. That, actually, he's better than that." Dwyre can be reached at bill.dwyre@latimes.com. I am just a big basketball fan. Since I am in my 70s I remember all those good teams, as bob hope would say thanks for memories.